Parliamentary Secretary for Regional Victoria, Danielle Green MP visited Moyston on Friday to officially open the redeveloped Moyston Hall. 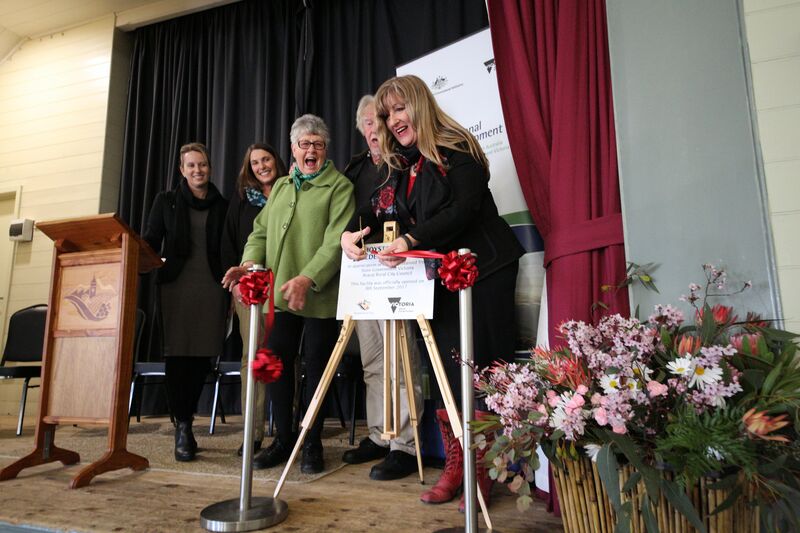 Parliamentary Secretary for Regional Victoria, Danielle Green MP cuts the ceremonial ribbon, watched on by Moyston Hall Committee members Brian Kennedy and Ann Marshall, and Ararat Rural City Council Interim CEO Colleen White and Councillor Jo Armstrong. Ms Green was joined at the ceremony by Ararat Rural City Council Interim CEO Colleen White, Ararat Rural City Councillors Jo Armstrong and Peter Beales, members of the Moyston Hall Committee, project architect Peter Dunn, Ararat Rural City Council Staff and Moyston locals. A Project Control Group was established in 2014 to deliver the redevelopment of the hall, which has seen major upgrades to make the venue more accessible for all abilities. The redevelopment was made possible by a $330,000 contribution from The Andrews Government via its Regional Jobs and Infrastructure Fund, with Ararat Rural City Council adding a further $150,000 towards the upgrade. Representing Ararat Rural City Council Mayor, Cr Paul Hooper, Councillor Armstrong said the redevelopment of rural halls was integral to communities by providing places and spaces for people to meet, gather and socialise. “For many years this venue has been a place that has brought the community together and it is wonderful to see so many locals here today,” she said. “That is exactly what this project has been about – delivering a community space for the great people of this town. The outside of the redeveloped Moyston Hall. A large crowd attend the official opening of the redeveloped Moyston Hall.